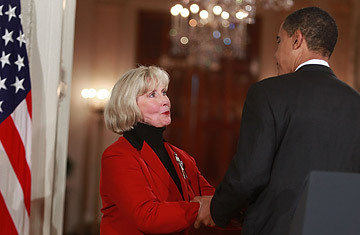 U.S. President Barack Obama shakes hands with Lilly Ledbetter before signing the "Lilly Ledbetter Fair Pay Act on January 29, 2009.  Lives in Jacksonville, Ala. and is 70 years old, a mother and grandmother. Her husband died in December.  Hired at the Alabama Goodyear Tire and Rubber Company in 1979 and worked as an overnight supervisor (7 p.m. to 7 a.m.) for nearly two decades.  During her career at Goodyear, Ledbetter suffered sexual harassment and day-to-day discrimination. She testified before Congress in 2007 that a supervisor once asked for sexual favors in return for good job performance evaluations. After Ledbetter complained about the supervisor to the Equal Employment Opportunity Commission (EEOC), he was reassigned, but Ledbetter said she felt isolated at work and experienced a long-term pattern of discrimination.  Got periodic pay raises, but all compensation information was kept confidential at her company. She received a Top Performance Award in 1996.  Shortly before she was due to retire in 1998, an anonymous co-worker slipped a note into her mailbox at work comparing her pay against that of three other male counterparts. Ledbetter was making $3,727 per month, while men doing the same job were paid $4,286 to $5,236 per month. Ledbetter filed a complaint with the EEOC and was then assigned to lift heavy tires, which she felt was retribution.  Sued Goodyear, which claimed it paid Ledbetter less than other male workers because she was not a good worker. A jury awarded Ledbetter about $3.3 million, but the amount was later reduced to around $300,000. Subsequently, the Supreme Court voted 5-4 that Ledbetter was not entitled to compensation because she filed her claim more than 180 days after receiving her first discriminatory paycheck.  The new bill changes the Civil Rights Act so that workers can sue up to 180 days after receiving any discriminatory paycheck.  Met Obama while he was a senator and campaigned on his behalf. Obama and the future First Lady talked about Ledbetter regularly on the stump and the Alabama native rode with Obama as he took a celebratory train trip to Washington, D.C. before the inauguration. Ledbetter attended the inauguration and danced with the President at a ball afterwards.  Says that she lives paycheck to paycheck; has no expectation of ever getting any restitution from Goodyear Tire.  "I told my pastor when I die, I want him to be able to say at my funeral that I made a difference."  "I'm just thrilled that this has finally passed and sends a message to the Supreme Court: You got it wrong."  "I will be a second-class citizen for the rest of my life ... It affects every penny I have today."  "I'm so excited I can hardly stand it."  "There was nothing I wouldn't do, no matter how dirty or hard."  "This started out personal for her, but now she is standing up for other women including my sister Vickie and my 2-year-old daughter Grace."  "This brave woman needs to be commended."  "A worker knows immediately if she is denied a promotion or transfer, if she is fired or refused employment. And promotions, transfers, hirings, and firings are generally public events, known to co-workers. When an employer makes a decision of such open and definitive character, an employee can immediately seek out an explanation and evaluate it for pretext. Compensation disparities, in contrast, are often hidden from sight."  "She's long since lost her ability to gain any financial return from her Supreme Court loss, but she is out on the road, fighting hard to make sure that our daughters and granddaughters get paid equally for the work that they do. She's a special lady, a working class lady, and a fighter."